For other uses, see Nous (disambiguation). "Noesis" redirects here. For other uses, see Noesis (disambiguation). Nous (UK: /naʊs/, US: /nuːs/), sometimes equated to intellect or intelligence, is a term from classical philosophy for the faculty of the human mind necessary for understanding what is true or real. English words such as "understanding" are sometimes used, but three commonly used philosophical terms come directly from classical languages: νοῦς or νόος (from Ancient Greek), intellēctus and intellegentia (from Latin). To describe the activity of this faculty, the word "intellection" is sometimes used in philosophical contexts, as well as the Greek words noēsis and noeîn (νόησις, νοεῖν). This activity is understood in a similar way (at least in some contexts) to the modern concept of intuition. In the Aristotelian scheme, nous is the basic understanding or awareness that allows human beings to think rationally. For Aristotle, this was distinct from the processing of sensory perception, including the use of imagination and memory, which other animals can do. This therefore connects discussion of nous to discussion of how the human mind sets definitions in a consistent and communicable way, and whether people must be born with some innate potential to understand the same universal categories in the same logical ways. Deriving from this it was also sometimes argued, especially in classical and medieval philosophy, that the individual nous must require help of a spiritual and divine type. By this type of account, it came to be argued that the human understanding (nous) somehow stems from this cosmic nous, which is however not just a recipient of order, but a creator of it. Such explanations were influential in the development of medieval accounts of God, the immortality of the soul, and even the motions of the stars, in Europe, North Africa and the Middle East, amongst both eclectic philosophers and authors representing all the major faiths of their times. In early Greek uses, Homer used nous to signify mental activities of both mortals and immortals, for example what they really have on their mind as opposed to what they say aloud. It was one of several words related to thought, thinking, and perceiving with the mind. In pre-Socratic philosophy, it became increasingly distinguished as a source of knowledge and reasoning opposed to mere sense perception or thinking influenced by the body such as emotion. For example, Heraclitus complained that "much learning does not teach nous". Among some Greek authors, a faculty of intelligence known as a "higher mind" came to be considered as a property of the cosmos as a whole. The work of Parmenides set the scene for Greek philosophy to come and the concept of nous was central to his radical proposals. He claimed that reality as the senses perceive it is not a world of truth at all, because sense perception is so unreliable, and what is perceived is so uncertain and changeable. Instead he argued for a dualism wherein nous and related words (the verb for thinking which describes its mental perceiving activity, noein, and the unchanging and eternal objects of this perception, noēta) describe a form of perception which is not physical, but intellectual only, distinct from sense perception and the objects of sense perception. All other things partake in a portion of everything, while nous is infinite and self-ruled, and is mixed with nothing, but is alone, itself by itself. For if it were not by itself, but were mixed with anything else, it would partake in all things if it were mixed with any; for in everything there is a portion of everything, as has been said by me in what goes before, and the things mixed with it would hinder it, so that it would have power over nothing in the same way that it has now being alone by itself. For it is the thinnest of all things and the purest, and it has all knowledge about everything and the greatest strength; and nous has power over all things, both greater and smaller, that have soul [psychē]. 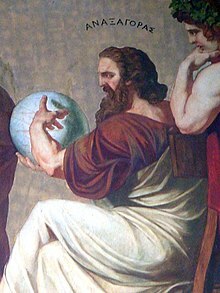 Xenophon, the less famous of the two students of Socrates whose written accounts of him have survived, recorded that he taught his students a kind of teleological justification of piety and respect for divine order in nature. This has been described as an "intelligent design" argument for the existence of God, in which nature has its own nous. For example, in his Memorabilia 1.4.8, he describes Socrates asking a friend sceptical of religion, "Are you, then, of the opinion that intelligence (nous) alone exists nowhere and that you by some good chance seized hold of it, while—as you think—those surpassingly large and infinitely numerous things [all the earth and water] are in such orderly condition through some senselessness?" Later in the same discussion he compares the nous, which directs each person's body, to the good sense (phronēsis) of the god, which is in everything, arranging things to its pleasure (1.4.17). Plato describes Socrates making the same argument in his Philebus 28d, using the same words nous and phronēsis. Plato used the word nous in many ways that were not unusual in the everyday Greek of the time, and often simply meant "good sense" or "awareness". On the other hand, in some of his Platonic dialogues it is described by key characters in a higher sense, which was apparently already common. In his Philebus 28c he has Socrates say that "all philosophers agree—whereby they really exalt themselves—that mind (nous) is king of heaven and earth. Perhaps they are right." and later states that the ensuing discussion "confirms the utterances of those who declared of old that mind (nous) always rules the universe". Concerning the nous that is the source of understanding of individuals, Plato is widely understood to have used ideas from Parmenides in addition to Anaxagoras. Like Parmenides, Plato argued that relying on sense perception can never lead to true knowledge, only opinion. Instead, Plato's more philosophical characters argue that nous must somehow perceive truth directly in the ways gods and daimons perceive. What our mind sees directly in order to really understand things must not be the constantly changing material things, but unchanging entities that exist in a different way, the so-called "forms" or "ideas". However he knew that contemporary philosophers often argued (as in modern science) that nous and perception are just two aspects of one physical activity, and that perception is the source of knowledge and understanding (not the other way around). Just exactly how Plato believed that the nous of people lets them come to understand things in any way that improves upon sense perception and the kind of thinking which animals have, is a subject of long running discussion and debate. On the one hand, in the Republic Plato's Socrates, in the Analogy of the sun and Allegory of the Cave describes people as being able to perceive more clearly because of something from outside themselves, something like when the sun shines, helping eyesight. The source of this illumination for the intellect is referred to as the Form of the Good. On the other hand, in the Meno for example, Plato's Socrates explains the theory of anamnesis whereby people are born with ideas already in their soul, which they somehow remember from previous lives. Both theories were to become highly influential. As in Xenophon, Plato's Socrates frequently describes the soul in a political way, with ruling parts, and parts that are by nature meant to be ruled. Nous is associated with the rational (logistikon) part of the individual human soul, which by nature should rule. In his Republic, in the so-called "analogy of the divided line", it has a special function within this rational part. Plato tended to treat nous as the only immortal part of the soul. Like Plato, Aristotle linked nous to logos (reason) as uniquely human, but he also distinguished nous from logos, thereby distinguishing the faculty for setting definitions from the faculty that uses them to reason with. In his Nicomachean Ethics, Book VI Aristotle divides the soul (psychē) into two parts, one which has reason and one which does not, but then divides the part which has reason into the reasoning (logistikos) part itself which is lower, and the higher "knowing" (epistēmonikos) part which contemplates general principles (archai). Nous, he states, is the source of the first principles or sources (archai) of definitions, and it develops naturally as people gain experience. This he explains after first comparing the four other truth revealing capacities of soul: technical know how (technē), logically deduced knowledge (epistēmē, sometimes translated as "scientific knowledge"), practical wisdom (phronēsis), and lastly theoretical wisdom (sophia), which is defined by Aristotle as the combination of nous and epistēmē. All of these others apart from nous are types of reason (logos). The intellect from outside, which became the "acquired intellect" in Islamic philosophy, describes the incorporeal active intellect which comes from outside man, and becomes an object of thought, making the material intellect actual and active. This term may have come from a particularly expressive translation of Alexander into Arabic. Plotinus also used such a term. In any case, in Al-Farabi and Avicenna, the term took on a new meaning, distinguishing it from the active intellect in any simple sense - an ultimate stage of the human intellect where a kind of close relationship (a "conjunction") is made between a person's active intellect and the transcendental nous itself. Of the later Greek and Roman writers Plotinus, the initiator of neoplatonism, is particularly significant. Like Alexander of Aphrodisias and Themistius, he saw himself as a commentator explaining the doctrines of Plato and Aristotle. But in his Enneads he went further than those authors, often working from passages which had been presented more tentatively, possibly inspired partly by earlier authors such as the neopythagorean Numenius of Apamea. Neoplatonism provided a major inspiration to discussion concerning the intellect in late classical and medieval philosophy, theology and cosmology. Soul (psychē). The soul is also an energeia: it acts upon or actualizes its own thoughts and creates "a separate, material cosmos that is the living image of the spiritual or noetic Cosmos contained as a unified thought within the Intelligence". So it is the soul which perceives things in nature physically, which it understands to be reality. Soul in Plotinus plays a role similar to the potential intellect in Aristotelian terminology. Greek philosophy had an influence on the major religions that defined the Middle Ages, and one aspect of this was the concept of nous. Gnosticism was a late classical movement that incorporated ideas inspired by neoplatonism and neopythagoreanism, but which was more a syncretic religious movement than an accepted philosophical movement. In Valentinianism, Nous is the first male Aeon. Together with his conjugate female Aeon, Aletheia (truth), he emanates from the Propator Bythos (Προπάτωρ Βυθος "Forefather Depths") and his co-eternal Ennoia (Ἔννοια "Thought") or Sigē (Σιγή "Silence"); and these four form the primordial Tetrad. Like the other male Aeons he is sometimes regarded as androgynous, including in himself the female Aeon who is paired with him. He is the Only Begotten; and is styled the Father, the Beginning of All, inasmuch as from him are derived immediately or mediately the remaining Aeons who complete the Ogdoad (eight), thence the Decad (ten), and thence the Dodecad (twelve); in all, thirty Aeons constitute the Pleroma. In his early years Augustine was heavily influenced by Manichaeism and afterwards by the Neo-Platonism of Plotinus. After his conversion to Christianity and baptism (387), he developed his own approach to philosophy and theology, accommodating a variety of methods and different perspectives. In this belief, the soul is created in the image of God. Since God is Trinitarian, Mankind is Nous, reason, both logos and dianoia, and Spirit. The same is held true of the soul (or heart): it has nous, word and spirit. To understand this better first an understanding of Saint Gregory Palamas's teaching that man is a representation of the trinitarian mystery should be addressed. This holds that God is not meant in the sense that the Trinity should be understood anthropomorphically, but man is to be understood in a triune way. Or, that the Trinitarian God is not to be interpreted from the point of view of individual man, but man is interpreted on the basis of the Trinitarian God. And this interpretation is revelatory not merely psychological and human. This means that it is only when a person is within the revelation, as all the saints lived, that he can grasp this understanding completely (see theoria). The second presupposition is that mankind has and is composed of nous, word and spirit like the trinitarian mode of being. Man's nous, word and spirit are not hypostases or individual existences or realities, but activities or energies of the soul - whereas in the case with God or the Persons of the Holy Trinity, each are indeed hypostases. So these three components of each individual man are 'inseparable from one another' but they do not have a personal character" when in speaking of the being or ontology that is mankind. The nous as the eye of the soul, which some Fathers also call the heart, is the centre of man and is where true (spiritual) knowledge is validated. This is seen as true knowledge which is "implanted in the nous as always co-existing with it". ^ See entry for νόος in Liddell & Scott, on the Perseus Project. ^ See entry for intellectus in Lewis & Short, on the Perseus Project. ^ Rorty, Richard (1979), Philosophy and the Mirror of Nature, Princeton University Press page 38. ^ "This quest for the beginnings proceeds through sense perception, reasoning, and what they call noesis, which is literally translated by "understanding" or intellect," and which we can perhaps translate a little bit more cautiously by "awareness," an awareness of the mind's eye as distinguished from sensible awareness." Strauss, Leo (1989), "Progress or Return", in Hilail Gilden (ed. ), An Introduction to Political Philosophy: Ten Essays by Leo Strauss, Detroit: Wayne State UP . ^ This is from I.130, the translation is by A.T. Murray, 1924. ^ a b Kirk; Raven; Schofield (1983), The Presocratic Philosophers (second ed. ), Cambridge University Press Chapter XII. ^ Kalkavage (2001), "Glossary", Plato's Timaeus, Focus Publishing . In ancient Greek the word was used for phrases such as "keep in mind" and "to my mind". ^ Fowler translation of the Phaedo as on the Perseus webpage: 97-98. ^ Philebus on the Perseus Project: 23b-30e. Translation is by Fowler. ^ Stanford Encyclopedia of Philosophy, Aristotle's Ethics, Glossary of terms. ^ "Intelligence (nous) apprehend each definition (horos meaning "boundary"), which cannot be proved by reasoning". Nicomachean Ethics 1142a, Rackham translation. ^ Nicomachean Ethics VI.xi.1143a-1143b. Translation by Joe Sachs, p. 114, 2002 Focus publishing. The second last sentence is placed in different places by different modern editors and translators. ^ Generation of Animals II.iii.736b. Chisholm, Hugh, ed. (1911). "Alexander of Aphrodisias" . Encyclopædia Britannica. 1 (11th ed.). Cambridge University Press. p. 556. ^ Hippolytus of Rome, Refutation of All Heresies, vi. 29-31; Theodoret, Haer. Fab. i. 7. ^ Iren. I. xxiv. 4; Theod. H. E. i. 4. ^ Clement of Alexandria, Strom. iv. 25. ^ Hipp. vi. 12 ff. ; Theod. I. i. ^ Ap. Hipp. vi. 18. ^ Davidson pp.12-14. One possible inspiration mentioned in a commentary of Aristotle's De Anima attributed to John Philoponus is a philosopher named Marinus, who was probably a student of Proclus. He in any case designated the active intellect to be angelic or daimonic, rather than the creator itself. ^ Davidson p.18 and p.45, which states "Within the translunar region, Aristotle recognized no causal relationship in what we may call the vertical plane; he did not recognize a causality that runs down through the series of incorporeal movers. And in the horizontal plane, that is, from each intelligence to the corresponding sphere, he recognized causality only in respect to motion, not in respect to existence." ^ a b Davidson ch. 4. ^ Cross, Frank L.; Livingstone, Elizabeth, eds. (2005). "Platonism". The Oxford Dictionary of the Christian Church. Oxford Oxfordshire: Oxford University Press. ISBN 0-19-280290-9. ^ TeSelle, Eugene (1970). Augustine the Theologian. London. pp. 347–349. ISBN 0-223-97728-4. March 2002 edition: ISBN 1-57910-918-7. ^ G.E.H; Sherrard, Philip; Ware, Kallistos (Timothy). The Philokalia, Vol. 4 Pg432 Nous the highest facility in man, through which - provided it is purified - he knows God or the inner essences or principles (q.v.) of created things by means of direct apprehension or spiritual perception. Unlike the dianoia or reason (q.v. ), from which it must be carefully distinguished, the intellect does not function by formulating abstract concepts and then arguing on this basis to a conclusion reached through deductive reasoning, but it understands divine truth by means of immediate experience, intuition or 'simple cognition' (the term used by St Isaac the Syrian). The intellect dwells in the 'depths of the soul'; it constitutes the innermost aspect of the heart (St Diadochos, 79, 88: in our translation, vol. i, pp.. 280, 287). The intellect is the organ of contemplation (q.v. ), the 'eye of the heart' (Makarian Homilies). ^ a b The Mystical Theology of the Eastern Church, by Vladimir Lossky SVS Press, 1997, pg 33 (ISBN 0-913836-31-1). James Clarke & Co Ltd, 1991, pg 71 (ISBN 0-227-67919-9). ^ Hobbes, Thomas, "II. Of Imagination", The English Works of Thomas Hobbes, 3 (Leviathan) and also see De Homine X. ^ Think Exist on Blaise Pascal. Retrieved 12 Feb. 2009.